A former President of the United States of America once proclaimed ‘There’s an old saying in Tennessee — I know it’s in Texas, probably in Tennessee — that says, fool me once, shame on — shame on you. Fool me — you can’t get fooled again.’ While the meaning of this profound statement can be debated, it seemed relevant in light of today’s news via the Associated Press. In what appears to be a repeat of Groundhog’s Day, (no, not that ground hog) Mayor de Blasio is again vowing to upturn the Carriage Horse Industry. Despite last week’s cancelled vote after the Teamsters Union for the Carriage Drivers pulled out of the negotiations, the mayor is putting the possibility of limiting the industry back on the table. LANDMARK WEST! believes that the horses are part of the essential character of Central Park and that the Scenic Landmark was indeed designed with them in mind. The mayor’s position on this issue jeopardizes the industry, potentially risking not only 40-50 jobs, according to his own FACT SHEET, but also assumes $25 million in public funding for a new facility for the horses. The one named site is the Calvert Vaux & Jacob Wry Mould “Shops” building along the 85th Street Transverse. This 1873 landmark building would undergo a significant overhaul to accommodate a fraction of the historic industry, but effectively would be privatized for profit. Imagine New York City spending $25 million of your tax dollars for any other for profit venture that benefited an industry that was doing just fine on its own! Further, the prior bill, Intro. 573-a called for a ban of the pedicab industry within the park, below 86th Street. As written, the compromise of the bill unnecessarily chastises the pedicab industry, (further challenging jobs), does not appease the animal rights group NYCLASS, (which hoped for a complete ban), and ruffles feathers at the Parks Department, whose staff will be shipped to another borough. As written, it does not help the Carriage Industry which will be slashed in half, it does not help New Yorkers who will lose park space, a landmark building, and tax dollars to privatization, and it does not help the remaining horses who will be out of work and sent “to a better place”. 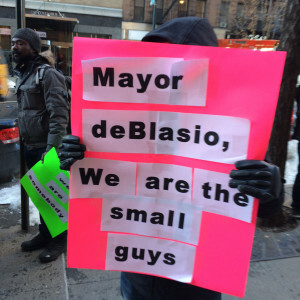 After yet another failed attempt at resolution, its not helping Mayor de Blasio’s reputation either. In the mean time, while all the horses in the carriage industry are housed in privately held stables, as of November of 2015, there were the highest rates of homelessness in NYC since the Great Depression: “59,929 homeless people, including 1,476 homeless families with 23,912 homeless children”…all of whom could greatly benefit from $25 million in investment in their future.